YOU WORK TO PROTECT YOUR PATIENTS. We work to protect you. less thing to worry about until your return. OR SCAN TO LEARN MORE! Opinions expressed by authors are their own, and not necessarily those of The Bulletin, SCCMA, or MCMS. The Bulletin reserves the right to edit all contributions for clarity and length, as well as to reject any material submitted in whole or in part. Acceptance of advertising in The Bulletin in no way constitutes approval or endorsement by SCCMA/ MCMS of products or services advertised. The Bulletin and SCCMA/MCMS reserve the right to reject any advertising. Address all editorial communication, reprint requests, and advertising to: Pam Jensen, Managing Editor 700 Empey Way San Jose, CA 95128 408/998-8850, ext. 3012 Fax: 408/289-1064 pjensen@sccma.org © Copyright 2013 by the Santa Clara County Medical Association. CHIEF EXECUTIVE OFFICER William C. Parrish, Jr.
on MICRA, Californiaâ&#x20AC;&#x2122;s landmark tort reform law. ago, it was the number one killer of American children. The story of eight Rwandan children was told in the screening of the academy award nominated documentary, “Open Heart” http:// vimeo.com/47069120). It’s a compelling story of the resilience of these children and incredible dedication of the physicians and staff that support them through their treatment, recovery and return home. The film will be shown on HBO later this month and I hope you will be as inspired as I was in watching it. Eric Talbert is based in San Francisco and welcomes questions, comments and support from our medical community (info@emergencyusa.org). 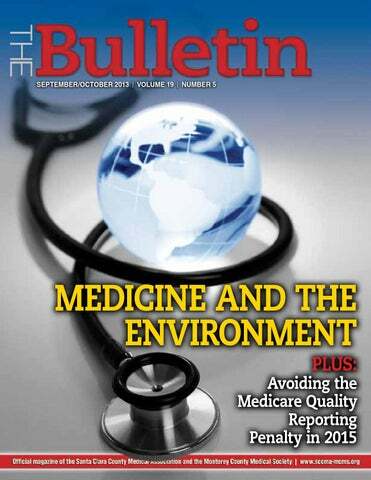 Joseph S. Andresen, MD, is the editor of The Bulletin. He is board certified in anesthesiology and is currently practicing in the Santa Clara Valley area. and how you can help in the fight by visiting www.cmanet.org/micra, and then make a contribution to CMA’s political action committee (CALPAC) to protect MICRA! If you know of a colleague who is not a member, urge them to join now. Together we are stronger! Some predict we will have a gas and oil boom here in California like the 1849 Gold Rush, especially in the Monterey Shale territory where “unconventional” deeper drilling is necessary for extraction. What will happen to our Golden State, if this continues? Will it be transformed overnight, like North Dakota, into a polluted industrial wasteland where NASA can see the wasted flared natural gas from outer space? (301(302) Or as in Dimock, Pennsylvania, where they have to truck in drinking water to farms? Quick cash, but with larger long term problems that threaten not only our economy, but our health and way of life. In California, we have three unique features that make the possibility of increased deep fracking much more frightening. Food: We have produced the majority of the country’s fruits and vegetables for over 50 years, due to California’s year-round temperate climate and rich soil. We are the number one dairy state. (140) (141) (276) Water: We have an increasing scarcity of water with nature and farms already competing. Government agencies agree we have a water crisis in California. (169) Earthquakes: The Monterey Shale is very close to the San Andreas Fault. (169) Do we really need a flash of oil and gas development to stimulate the economy, or will oil and gas undermine our sustainability goals? California has the opportunity to build on our already strong economy with clean sustainable energy sources including solar, wind, and energy conservation. and click on the “Committees/Environmental Health” tab. Managing Director, Marsh There is no doubt that the ACA is the most transformational change in health insurance since Medicare. It’s survived a Supreme Court challenge, presidential election, and continuing congressional attempts at repeal, modification or defunding (40 attempts at last count). One thing is for certain: while there may be delays in implementing certain parts of the law, it is not going away. You’ll need to know the basics to evaluate how it influences your medical insurance buying decisions. The following will help with your decision making process that lies ahead. ȧȧ In 2016: the greater of $695/ individual (3 per family), or 2.5% of income •	Guaranteed Issue – Insurance companies must sell coverage to everyone, regardless of pre-existing conditions, and can’t charge more based on health or gender. •	Health Insurance Exchange – Individuals without access to affordable, employer-sponsored plans that provide qualifying coverage can enroll in plans offered either through the individual insurance market or through Covered California, the state-based exchange with coverage beginning January 1, 2014. Open Enrollment for Covered California commences on October 1, 2013. Since there will be a great deal of traffic and confusion, you may wish to wait until late in October to review your options. If individuals don’t enroll with the exchange during the initial open enrollment period, they will have to wait until next year’s open enrollment period to obtain coverage. Beginning January 1, 2014, new regulations provide most Americans access to affordable health insurance that covers essential care. The regulations that facilitate this include: •	Individual Mandate – Most individuals are required to have and maintain health insurance effective January 1, 2014. There are exceptions for certain individuals. percent and 400 percent of the federal poverty level (FPL) may be subsidy eligible. Benefit subsidies will also be available to provide assistance with co-pays and out of pocket amounts for individuals who earn less than 250% of the FPL. •	Premiums – Premiums can only vary by age, geography, and family composition in California. They may not vary by gender or health conditions. •	Annual or Lifetime Limits – Individual and group plans may not impose limits on essential benefits. •	Out of Pocket Expenses – Limits out-of-pocket expenses for co-pays, co-insurance, deductibles, etc., to $6,350 per individual to a maximum of $12,700/family annually. individuals, and for a family of four between $32,500 and $94,200. Individual plans in and out of the exchange will provide guaranteed issue coverage and include essential benefits and plan designs that meet the four metal levels: platinum, gold, silver and bronze. A silver plan is meant to cover 70% of an average person’s expenses with the insured expected to pay 30% for deductibles, co-pays, co-insurance, etc. •	Existing coverage: If you currently have an individual policy in force, one of two things can occur: ȧȧ If the plan was in place prior to the ACA signing on March 23, 2010, and has not undergone any significant change since, it may be continued. ȧȧ If an individual’s plan is not grandfathered, and the plan of benefits does not meet one of the tiered metal levels, the benefits will be modified. This will likely have an impact on plan premiums as well. Individuals trapped in old, high-priced plans due to health conditions, are now eligible to move to a new plan at possibly lower costs without having to be concerned about underwriting considerations. The individual should look very carefully at the provider networks available under each plan to ensure they are still able to seek care from their personal physician and hospital. Let Marsh be your partner on this new adventure. For more health care reform communications, including information on the Marsh/ Seabury & Smith Insurance Program Management private health care exchange for members, please call Marsh at 800-842-3761 or go to www. CountyCMAMemberInsurance.com. Marsh and the association/society do not provide tax or legal advice. Please consult with your own advisors to determine how the law’s changes and your decisions impact your personal situation. TPO and Littler will guide you through an informative day, balancing both Legal and Leadership Best Practices to prepare you for 2014! 2014 Employment Law & Leadership Conference A PREMIER CONFERENCE FOR BUSINESS OWNERS, MANAGERS, HR, RISK MANAGEMENT AND LEGAL COUNSEL IN PUBLIC, PRIVATE AND NON-PROFIT ORGANIZATIONS COST: TPO Members attend FREE* as part of their Annual Membership! **Charge for participants above the number of your authorized representatives. Use Code SCCMA/MCMS for TPO’s Discount Rate. Go to www.tpohr.com/event for more information REGISTRATION CAN’T BE EASIER! All conference registrations must be paid by check or credit card prior to, or on the day of the conference. forging ahead. “At the moment, there is not much information available on the topic of ingested nanoparticles and human health,” says Birgit Gaiser, PhD, a postdoctoral research fellow at HeriotWatt University in the UK. “Some nanoparticles are present in the human diet, for example titanium dioxide in food products and cosmetics, and silver, which is sold as a nutritional supplement. There is evidence that a small percentage of these particles, or particle components like silver ions which can be released in stomach acid, can move on from the intestinal tract into the blood, and reach other organs. This is why we believe it is important to assess the risk of even small amounts of particles in the human body and ensure that the types of particles present in the human diet and cosmetics, as well as the amounts ingested, can be considered safe.” The FDA has been slow to catch up. In fact, the agency doesn’t even track which foods contain nanoparticles. Following is a recent e-mail exchange with Sebastian Cianci, a spokesperson at the FDA: E Magazine: What can you tell me about the prevalence of nanomaterials in our food supply? Sebastian Cianci: FDA does not have a list of food products that contain nanomaterials. E: Where are nanomaterials most often found within food products? In colorings or additives? S.C.: FDA does not maintain a list of food products that contain nanomaterials, so we cannot reliably answer this question. IMQ LAUNCHES ONE-STOP ONLINE CME PLATFORM The Institute for Medical Quality has launched IMQ Online Education, a new online platform for continuing medical education. IMQ Online Education is a one-stop shop for medical staff seeking CME: the platform offers users a growing selection of courses on a variety of subjects, accessible at any time and from any Internet-enabled device, and the means to keep track of courses completed and credits earned. IMQ Online Education provides access to courses for AMA PRA Category 1 CreditTM, as well as other forms of continuing-education credit. A diverse course catalog makes it easy for physicians and other health care professionals to maintain their licenses and meet board certification requirements. IMQ Online Education courses come in a variety of formats, lengths, and credit levels, and are organized by subject category for easy browsing. A searchable course catalog helps users find the courses that are most useful to them. The accessibility of online education allows users to meet their educational requirements when and where it’s convenient for them. Users earn credits immediately upon completing each course, eliminating the need to wait for credit. For courses already completed, IMQ Online Education makes record-keeping simple. Users can track credits and keep online records on hand for easy access. To browse the IMQ Online Education catalog and register for courses, visit http://imq.inreachce.com/. Why Attend Stepping Up to Leadership The Institute for Medical Quality and the PACE Program at UC San Diego are proud to announce an unparalleled opportunity for medical staff leaders. The Stepping Up to Leadership program trains medical staff leaders in issues of communication, problem-solving, and improving outcomes for patients and staff—and it’s more accessible than ever. The Stepping Up to Leadership conference will take place on November 7-9, 2013; March 6-8, 2014; and May 8-10, 2014. So why should your medical staff attend the Stepping Up to Leadership conference? understanding of communication and assessment—and passes them on to medical staff leaders. Stepping Up to Leadership offers unique hands-on learning opportunities, focusing on interactive small-group teaching modalities for deep understanding. The program features excellent faculty and course work on effective staff leadership, credentialing and privileging, assessing the needs of the organization, using CME effectively, resolving on-call issues, improved communication skills, using quality measures effectively, legal considerations, and managing disruptive or impaired colleagues. Stepping Up to Leadership is accessible. For the first time, Stepping Up to Leadership is available as a national event, with events in San Antonio, Texas (November 7-9, 2013); San Diego, California (March 6-8, 2014); and Washington, D.C. (May 8-10, 2014). A generous grant from The Physicians Foundation allows IMQ and PACE to offer Stepping Up to Leadership at prices as low as $595 for three days, making this an unbeatable opportunity. To register, visit http://physician-leadership.org. Competitive pricing and superior service for your Billing, Collection, and Consulting needs. Committed to providing superior billing and collection services to physicians and other professional providers of health services while upholding the professional integrity of those we represent. 2998 S. Bascom Ave, San Jose New medical/dental development. Brand new interiors, elevator & lobby. Full TURN-KEY TI’s Available. Central West Valley location. 881 Fremont Ave, Los Altos 2-story, elevator served building located in close proximity to the Loyola Corners District of Los Altos. Office &/or Medical office. 393 Blossom Hill Road San Jose Modern Class A medical building. Easy access to 85 and 101, and great promotional rate! High traffic corner of Saratoga and Moorpark. Great location & signage. Office/Retail or Medical uses allowed. EZ access to Hwy 280. Fully built-out medspa office available in newer medical/ retail center near Santana Row & freeways. New building, must see! Neighborhood shopping center with wide array of retail tenants with Ross Dress For Less anchor. Fully plumbed dental suite available NOW. 50 E. Hamilton Ave, Campbell Corner of Campbell Ave. and E. Hamilton Ave. Minutes from Good Samaritan Hospital & O’Connor Hospital. 4155 Moorpark Ave, San Jose Great medical location at Saratoga & Moorpark Ave. Convenient freeway access, excellent price! 825 Pollard Road, Los Gatos Great medical building, steps away from El Camino Hospital. Ground floor unit, TI dollars available. 10353 Torre Ave, Cupertino Rare medical/dental suite available at Torre Professional Ctr. Excellent Cupertino location with EZ access to hwy 85 & 280. Walking distance to city hall. 877 W. Fremont Ave, Sunnyvale Foothill Medical-Dental Center is a 6 plus acre medical project in the heart of Sunnyvale. Various medical and plumbed (dental) suites available. Call us for your Office Checkup! 14910 Los Gatos Blvd, Los Gatos Parcel: 21,400 SF. This is a BTS Opportunity . Call for more info. PLEASE DO NOT DISTURB TENANT. 189 N. Bascom Ave, San Jose Fully plumbed dental suite available for LEASE. EZ access to Hwy 280 & 880. Small medical office space available NOW. Perfect for an acupuncturist or chiropractic use. Medical Suite Available. Great location with easy Fwy access and close to Good Samaritan Hospital. 15215 National Ave, Los Gatos Professional Medical/Dental bldg. Easy access ground floor unit. TI $ available for qualified tenants. Kifer Commerce Park is an upscale office condo development. Unit 511 is 100% office. The unit has an open ofc floor plan with 2 ADA restrooms. SBA Financing available. Great ownership opportunity! 233 Oak Meadow Drive, Los Gatos Rare purchase opportunity in Los Gatos. Attractive SBA Financing Avalable. Walking distance to DT. Medical Office Bldg. with established Medical Dental Suites Available. tenants located directly adjacent to Shared or private reception area. Oâ&#x20AC;&#x2122;Connor Hospital. Flexible terms Available NOW. 2 story building. Elevator served. HealthMed Realty is a Full-Service Commercial Real Estate Firm specializing in Medical & Dental Real Estate. Put our experience on your side and we will save you time and money. 690 Saratoga Avenue | Suite 200 | San Jose, CA 95129 408.217.6000 T | 408.457.8803 F www.healthmedrealty.com | Lic# 01902032 ithout notice. By Cindy Lee Russell, MD VP-Community Health, Santa Clara County Medical Association Most of us cannot live without our computers, text messaging, e-mail, and immediate access to the vast cloud of information, especially kids and teenagers who have grown up in the age of the Internet. In fact, more schools are integrating computers at younger ages, even in kindergarten. Forty-nine states are phasing out cursive handwriting altogether. What effects does it have, however, on learning, brain development, cognition, and brain health? Studies have shown some interesting ways that technology is rewiring and shaping our brain, which may not be “all good.” A growing body of scientific evidence suggests that the Internet, with its distractions and interruptions, is turning us into scattered, superficial thinkers. What does that portend for our kids? Several years ago, professors who were irritated with students surfing the Web and hiding behind laptop screens began banning the use of the Internet or laptops in the classroom. Laptops have been banned in classes at Harvard Law School, Yale, George Washington University, University of Virginia, and South Texas College of Law, to mention a few. (4)(15) A 2006 study by Carrie Fried backed up the policies, demonstrating that students who used laptops in class spent considerable time multitasking. They more importantly found that the level of laptop use was negatively related to several measures of student learning. (3) A 2012 survey by Elon University, the Pew Internet, and American Life Project asked over 1,000 leaders in the U.S. their thoughts about cognition in our millennial generation. They were asked to consider how the Internet and its environment are changing, for better or worse. Overall, the survey found that multitasking is the new norm and that hyper-connectivity may be leading to a lack of patience and concentration. The “always on” ethos may be encouraging a culture of expectation and instant gratification. The maturation of intelligence requires quiet, deep thought, and time. Established research findings in cognitive science leads to the conclusion that laptop use, especially with Wi-Fi access, could interfere with learning. The hippocampus, which lies under the cortex, is intimately involved in long-term memory storage. Initial experiences are stored and stabilized in the hippocampus and then later transferred to the cortex. Removal of the hippocampus does not affect long-term memories, but prevents new memories from forming. Learning depends on the ability to transfer information from our working memory to long-term memory and weave this into other acquired knowledge. There is a bottleneck in the passage of working memCindy Russell, MD, is the Vice-President of Community Health, Chair of the Environmental Health Committee, and a CMA Delegate with the Santa Clara County Medical Association. She is board certified in plastic surgery and is currently practicing with the Palo Alto Medical Foundation Group. ory to long-term memory. We have a limited ability as humans to capture and process information. The Internet provides too many choices and too much information at once. Excess distracting information creates “overload,” preventing long-term memorization and important information is lost. No one disagrees that we need to protect our memories. As author Nicholas Carr highlights, personal memory is not just for the individual to function, but it shapes and sustains our collective cultural memory. A growing body of peer reviewed research is showing neurologic damage to fetal brain and other systems from Wi-Fi and other microwave wireless sources. In a prior article, “Why-Fi: Is Wireless Communication Hazardous to Your Health?” in the Sept/Oct 2010 SCCMA Bulletin, the full range of effects of EMF from our cell phones and wireless devices was discussed. New basic science research in the last three years is confirming these findings. Initially, the Bioinitiative report of 2007 reviewed the biological effects of low level EMF. It found that there was clear evidence of adverse effects to living systems at current environmental exposures and at doses well below the threshold of the International Commission of NonIonizing Radiation Protection (ICNIRP) safety guidelines. Current microwave safety limits are based solely on the heating of tissue and do not take into account research showing negative biological effects on DNA, cancer, protein synthesis, skin tissue changes, sperm motility and viability, cognitive functioning, and disruption of the blood brain barrier. In Austria, the Austrian Medical Society has also issued a policy statement asking for a ban of Wi-Fi in schools. The U.K. has a useful frequently-updated website on Wi-Fi in schools, which provides much scientific research. http://www.wifiinschools.org. uk/ Still the controversy persists. There are a host of concerns with classroom technology, and the virtual world it creates, that have not been explored in the rush to “modernize” education and prevent our kids from becoming “computer illiterate,” despite the fact that computers are designed for ease of use. These issues range from distraction in the classroom, impairment of cognitive development and long-term memory, deficiency in learning social skills, Internet addiction, cyber bullying, access to inappropriate content, eye fatigue, and security risks to online learning networks. In addition, the sheer cost of computers and continuous upgrades is likely to break many school budgets. We have not mentioned the issue of toxic e-waste, another growing public health problem. We will not get rid of the Internet or computers. We should not ignore, however, the enlarging body of science that points to real threats to public health and, especially, our children’s safety and well-being. The best approach is precautionary. Reduce the risk by reducing the microwave emissions. It is our obligation as physicians and parents to protect our children. They are the future and our legacy. 1. Remove wireless devices (white boards and routers) in schools in favor of wired connections and fiberoptic. 2. If there is Wi-Fi, then give teachers the authority to turn it off when not in use or if they feel it is not necessary. 3. Ban cell towers near or on schools. 4. Limit screen time on computers. 5. Limit or ban cell phone use in the class. 6. Limit or ban cell phone use at home. 7. Do not allow laptops to be placed on laps. 8. Undertake independent scientific studies on Wi-Fi and computer use that look at acute and long-term health effects. 9. Train teachers how to recognize symptoms of EMF reactions. 10. Conduct meetings with parents and teachers to address this issue in each school. make a difference on the national level. 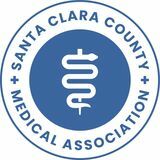 I want to again offer my sincere gratitude to the Santa Clara County Medical Association for this incredible opportunity to participate in this national discussion and to proudly represent and bring up health issues relevant for Stanford and Santa Clara County at the national level. Featuring representatives from PIMCO, SEI Investments and LWA. Reserve your attendance by email at Lawrence@lwallc.com or call (408)452-7700. If there are any specific questions you would like to be addressed at the panel discussion, please indicate in your response. was your greatest fear before you started your journey? Answer: No fears! Concerning “range anxiety,” i.e., apprehension about charging, there was very little (except our Santa Barbara experience below). The supercharger stations are 150 miles or Tesla inside shot less apart and the range of the car is 260 miles, so there was a lot of margin for error. Question: What was your hardest day and what happened? Answer: We spent the night in Santa Barbara and planned to charge the car up fully, so we could drive north on 101 and cut over on 46 to the supercharger station at Harris Ranch (200 miles). Because the charging station at our hotel was so slow, we could only charge to 210 miles, overnight, and I wasn’t willing to take the risk. Instead of going north, we had to head south a bit, cut over northern Ventura County to I-5 and up to the supercharger station in Lebec, at the foot of the Grapevine. It took extra time, but we enjoyed driving through the citrus orchards. Question: What was the most fun part…besides driving the car? Answer: It was fun hanging out at the supercharger stations with the other Tesla owners. At the one in Hawthorne, we met a guy who saved for ten years for his “dream car” and decided to get a Tesla. He was a truck driver and knew more about the car than anyone I’d met. Question: Overall how would you rate the performance of the car and compare to other cars you have owned? Answer: By far the best performing and nicest riding car I’ve ever owned! Cindy Russell, MD, is the Vice-President of Community Health, Chair of the Environmental Health Committee, and a CMA Delegate with the Santa Clara County Medical Association. She is board certified in plastic surgery and is currently practicing with the Palo Alto Medical Foundation Group. Question: Any other amusing stories? Answer: We went to an event sponsored by the Tesla Motors Club and I got to ask Elon Musk if we were going to have a Model S Hot Wheels. He suggested asking Mattel, so I started a petition, and it’s now before the head of the Hot Wheels division. Although the price tag for a Tesla Model S is not one affordable by many, the company is working on another model that will sell for about $35,000. Other all-electric cars on the road are the Nissan Leaf, which is about $30,000, and the Chevrolet Volt, which is about $40,000. There are also plug-in hybrids made by Toyota, Honda, Ford, and others that you can connect to a household wall socket. As electric vehicles go mainstream, more and more charging stations are being installed by small businesses and major corporations. At a recent electric vehicle show at the S.F. Exploratorium, more than 50 corporate executives showed up alongside Governor Brown to cheer the next generation of electric automobiles and trucks. Dr. Stillman has ventured even farther into sustainability by installing solar panels at his home, to power his Tesla. While stated EPA miles per gallon are higher for electric cars (80-120 mpg), they currently do not take into account the extraction, transportation, and refining of gasoline, the combustion efficiencies or thermal energy transfer of fossil fuels from the power plant to your home. When the math is done, the actual MPG is closer to 25 to 50 mpg, depending on the energy source. (4)(5) The analysis still favors electric cars, as they are zero emissions on the road and electricity from the grid can be generated from renewable resources such as solar, wind, and biofuels. In the U.S., 30 of 50 states have Renewable Portfolio Standards (RPS), regulations that require increased use of renewables in energy production. California’s RPS, signed by Governor Schwarzenegger in 2008, requires that electricity sellers derive 33% of their energy from renewable sources by 2020. In addition, electric cars are simpler machines with fewer moving parts and lower maintenance. While we still need to keep working on curbing our addiction to those pesky fossil fuels, we can have an exhilarating experience at the same time. Dr. Stillman has found a way to reduce his global-warming footprint and get that “Tesla Thrill” every day. To those of you who also own a Tesla, you know what that means. By Melanie Warner Reviewed by Cindy Russell, MD Did you ever open a long-expired box of cookies and find they looked and smelled perfectly normal? You may have eaten them without any gastric distress at all. It might have made you wonder, however, what the true expiration of processed foods really is and why. When New York Times business reporter Melanie Warner began writing about the food industry, she pondered the same questions. Her journey into the processed food world commenced when she started saving a host of processed foods in her pantry. She found even after six years, much of her food collection remained more or less unaltered. She writes, “so eternal, so unappealing to the mold and bacteria that normally feast on ignored leftovers and baked goods.” Cindy Russell, MD, is the Vice-President of Community Health, Chair of the Environmental Health Committee, and a CMA Delegate with the Santa Clara County Medical Association. She is board certified in plastic surgery and is currently practicing with the Palo Alto Medical Foundation Group. Melanie attended food conventions, taste-tested new “foods,” interviewed food scientists, and did in-depth research, eventually writing an entertaining and explosive primer valuable to anyone who eats, but especially working parents. She learns about the competing issues of shelf-life versus nutrition, and delves into the history and growth of processed foods. Particularly interesting is how Kraft developed its “pasteurized cheese loaf” in 1916, which was promoted as a product that could be “kept indefinitely without spoiling.” Begs the question, if bacteria can’t degrade it, what happens in your gut? Another intriguing finding was how cereal companies cleverly used six-year-olds to test-drive their sugary cereals. She notes marketing has been an important part of the food industry’s success. We also learn that there are serious deficiencies when it comes to processed food regulations. No surprise there. The book is highly recommended, as the author unravels the stories of synthesized food, food science, and agriculture in an amusing and pleasing style that keeps you craving the next chapter. You learn just how far away we have traveled from the farm. A bag of potato chips may never be quite the same for you. I recommend reading the book anyway. Help Create an AIDS-Free Generation Include routine HIV testing for all patients, regardless of their risk status, starting at age 13. HIV screening is recommended for all patients in all healthcare settings. Persons at high risk for HIV infection should be tested at least annually. For more information and to view a video on how to incorporate routine testing into your practice, please scan the QR code or visit http://bitly.com/bundles/prxinc/2. Per Health Care Decisions Law, Probate Code Section 4650 (the Patient Self-Determination Act passed in 1990): “in recognition of the dignity and privacy a person has a right to expect, the law recognizes that an adult has the fundamental right to control the decisions relating to his or her own health care, including the decision to have life-sustaining treatment withheld or withdrawn.” This federal legislation was designed to ensure patient self-determination for decisions about health care, including decisions about life-sustaining therapy. Patients have the right to execute advance directives and have them honored. However, for patients with an existing DNR order, it is a frequent occurrence – in some cases routine – to automatically suspend this order during the periprocedural period. At times, patients have been asked to choose between allowing resuscitation during surgery or the procedure, or forgoing the surgery or procedure. The application of a DNR order during surgery can be problematic for several reasons: 1. General anesthesia itself involves procedures often indistinguishable from resuscitative efforts. 2. The anesthetic agents themselves may produce adverse physiologic effects including respiratory depression, cardiovascular dysfunction, or even cardiac arrest. These adverse effects may be quickly and easily reversible. 3. In the case of invasive cardiac surgeries, arrhythmias including asystole can be after surgery. 4. Surgery itself may produce adverse effects, such as blood and fluid loss or pathophysiological reflexes that often are quickly and easily reversible. It is standard practice, prior to any invasive procedure, to discuss with the patient and/or surrogate decision-maker the potential risks and benefits inherent in the procedure. This informed consent process should include a discussion of whether to continue or to suspend an existing DNR order during the peri-surgical/procedural period and the duration of the suspension. Without informed refusal there cannot be informed consent. DNR Orders in the Periprocedural Period, continued from page 37 DNAR order to remain in place throughout the periprocedural period, according to the above guidelines. •	SPECIAL CONSIDERATION: PATIENTS WITH SEVERE CARDIAC DISEASE UNDERGOING INVASIVE CARDIAC PROCEDURES The risk of invasive cardiac (or, at times, pulmonary) surgery is high; the cardiothoracic surgeons can ask permission that their services not be limited until a realistic estimate of prognosis is established, and then are executed in accordance with the above guidelines. Any clarification or modifications made to the patient’s directive should be documented in the medical record. In cases where the patient or designated surrogate requests that the anesthesiologist or surgeon/ proceduralist use clinical judgment in determining which resuscitation procedures may become appropriate, the anesthesiologist or surgeon/proceduralist should document the discussion with specific reference to the goals and values of the patient. Plans for postoperative care should indicate if or when the suspended directive to limit the use of resuscitative procedures will be reinstated. This generally occurs when the patient has recovered from the acute effects of anesthesia and surgery/procedure. Consideration should be given to whether continuing to provide the patient with a time-limited postoperative/procedural trial of therapy would help the patient or surrogate better evaluate whether continued therapy would be consistent with the patient’s goals and values. Concurrence on these issues by the primary physician, the surgeon/ proceduralist, and the anesthesiologist is desirable. If possible, these physicians should meet together with the patient or surrogate when these issues are discussed. This duty of the patient’s physicians is deemed to be of such importance that it should not be delegated. Other members of the health care team who are directly involved with the patient’s care during the planned procedure should, if feasible, be included in this process. Should conflicts arise, the following resolution processes are recommended: •	When a member of the medical team finds either the patient’s or another member of the team’s limitation of intervention decisions to be irreconcilable with his/her own moral views, then this member should withdraw in a nonjudgmental fashion, providing in timely fashion an alternative for care. •	If a member of the medical team finds the patient’s or another member of the team’s limitation of intervention decisions to be in conflict with generally accepted standards of care, ethical practice, or institutional policies, then this member should voice such concerns and present the situation to the appropriate institutional body. A liaison should be established among representatives from the hospital’s anesthesiology, surgery/proceduralist, and nursing services for presentation, discussion, acceptance, and application of this policy/guidelines. Hospital staff should be made aware of the proceedings of these discussions and the motivation for them. Modification of this policy may be appropriate in emergency situations involving patients who lack capacity to make their own medical decisions and whose intentions beyond that of resuscitation efforts have not been previously expressed. 1. DNR in the OR: A Goal-directed Approach. Robert D. Truog, David B. Waisel, Jeffrey P. Burns. Anesthesiology 1999; 90:289295. 2. Do Not Resuscitate in the Operating Room: More Than Rights and Wrongs. Perry G. Fine, MD and Stephen H. Jackson, MD. American Journal of Anesthesiology 1995;22:45-51. 3. Ethical Guidelines for the Anesthesia Care of Patients With Do-Not-Resuscitate Orders or Other Directives That Limit Treatment. Committee on Ethics, American Society of Anesthesiologists House of Delegates statement originally published 1993, revised October 17, 2001, and last affirmed October 22, 2008. 4. Goals- and Values-directed Approach to Informed Consent in the “DNR” Patient Presenting for Surgery. Stephen Jackson MD and Gail Van Norman, MD, Anesthesiology, V90, No 1, Jan 1999. 5. Health Care Decisions Law CA, Probate Code Section 46004643 6. Informed Consent for the Patient With an Existing DNR Order. David B. Waisel and Robert D. Truog, MD. American Society of Anesthesiologists Newsletter 2001;65:13-14. 7. Perioperative Care of Patients With Do-Not-Resuscitate or All-Natural-Death Orders. AORN Position Statement, original approved by the House of Delegates March 1995, revision approved March 2009. 8. Statement on Advance Directives by Patients: “Do Not Resuscitate” in the Operating Room. American College of Surgeons. Bulletin of the American College of Surgeons, Vol. 79 No. 9, Page 29. Sept 1994. Benjamin Cory and Other Pioneer Physicians – Part 2 By Gerald Trobough, MD SCCMA Leon P. Fox Medical History Committee Two San Jose pioneer physicians were notables during Ben Cory’s time. They were Dr. Louis Hazelton Bascom and Dr. Alexander Josephus Spencer. Both physicians became partners of Dr. Cory. entertained the crowd at Slapjack Hall with beautiful music. San Jose became the first capitol of California, and the first legislature convened in December, 1849. A number of the legislators would frequent Grandma’s place and stay in the boarding house. Word spread throughout the mines about Grandma’s cooking, and the miners made sure to stop by for some famous pancakes when they came to town. They were always entranced by her constant chatter. Before the year was over, Grandma had more money than Dr. Bascom. When the State Capitol moved to Vallejo, Slap Jack Hall closed. Grandma, however, continued to entertain with her laughter and talking. With her talent for talking, she raised money for charity and the South Methodist Church. People would say, “We’ll pay you five dollars, if you’ll stop talking for five minutes!” Others paid her to talk, as she was a good story teller. Grandma never saw anything but the amusing side of life. No one had ever heard her speak ill of anyone or express unhappiness, even when her son and husband died. Grandma Bascom died in 1894, at the age of seventy-eight. Prepared and reprinted with permission by the Alameda-Contra Costa Medical Association As part of the Physician Quality Reporting System (PQRS), Medicare will impose a 1.5% penalty in 2015 on physicians and other providers who do not successfully report at least one individual quality measure for at least one patient in 2013. The purpose of this article is to help physicians avoid the penalty in 2015 by providing guidance on how to report at least one measure for at least one patient using Medicare claims. Since most physicians already submit Medicare claims for reimbursement, adding the additional PQRS reporting information to the claim will be the least burdensome way for most physicians to avoid the penalty. This article also touches upon how physicians can qualify for a quality reporting bonus and discusses some additional PQRS reporting options. However, this article is not intended to be an exhaustive discussion of PQRS, and resources are listed at the end of the article for those desiring additional information. For many physician practices not yet participating in PQRS, the simplest way to avoid the penalty in 2015 will be to report on one quality measure for at least one patient (preferably a few patients) on your Medicare claims. The process can be broken down into three steps: 1) selecting an appropriate measure; 2) identifying your Medicare patients to whom the measure applies; and 3) reporting the quality measure on your Medicare claims after an applicable patient encounter. ing the penalty in 2015, physicians should select a quality measure relating to an aspect of care that you will encounter in your Medicare patient population. Review the list of individual measures that are reportable by claims on page 42, and select the most frequent measure that applies to your Medicare patients. Although there are many individual measures that can be reported via claims, some physicians may not find specialtyspecific measures. Nevertheless, there may be a measure that reflects a general aspect of care that is not specialty-specific that may be applicable and can be reported for purposes of avoiding the penalty. “quality codes” and modifiers that may be used to report the measure, you are ready to start reporting. The final step is to establish a process in your office to ensure that you consistently identify eligible patients, correctly document the correlating clinical information in the patient’s chart, and accurately report the information on your Medicare claims. To ensure you successfully report for at least one patient, it is recommended that you overshoot the target and report the quality measure you select for at least several patients. With claims-based reporting, a quality code is billed like any other procedure or E/M code (on Line 24 of the CMS 1500 form or electronic equivalent). However, quality codes are billed at a $0.00 charge (or $0.01 if your billing system will not accept zero), and are denied by Medicare with remark code N365 indicating the code is not payable but is counted for tracking purposes. Quality codes are only counted when submitted in combination with an eligible diagnosis and service. Quality codes submitted by themselves or along with services that have already been paid will not be counted (i.e. no retroactive claims-based reporting). As with any other “billed” Medicare service, quality measures should be supported by documentation in the medical record, which will provide some protection in the event of an audit. Documentation should indicate in clinical terms the basis for the quality code that is reported; it is not sufficient to simply write the code in the medical record. tiative, they are unfortunately not even considered by CMS when determining penalties or incentives. Rather, avoiding the penalty in 2015 and obtaining incentives in 2013 and 2014 is entirely contingent on selecting measures that occur with enough frequency to ensure accurate reporting at or above PQRS minimum thresholds. EHR and Registry Reporting: In addition to claims-based reporting, physicians and other eligible providers can report PQRS measures through EHR systems (either directly or through a data-submission vendor) or through approved registries. Practices utilizing EHR systems should consult your vendors about implementing PQRS reporting in your practice, either for purposes of avoiding the penalty or earning the incentive bonus. One advantage of utilizing registry reporting is the ability to “retroactively” report quality measures for patient encounters for which the Medicare claim has already been submitted. Registry reporting provides a mechanism for physicians to report quality measures separate from the claims process. However, registry reporting may be an additional process or system in your medical practice, and you may prefer to utilize claimsbased reporting. Group Practice Reporting Option: The PQRS Group Practice Reporting Option (GPRO) is open to medical groups of any size, and provides different options depending on the size of the medical group. For example, in 2013, Group practices ranging in size from 25-99 eligible professionals will report 29 quality measures for 218 consecutive Medicare patients, or 411 consecutive patients for group practices with 100 or more professionals. Practices wishing to use GPRO must submit a self-nomination letter indicating interest in participation. The next opportunity for GPRO participation will be for the 2014 reporting period. Validation Process if Less Than Three Measures Can Be Reported: If fewer than three quality measures can be reported, physicians may still earn the incentive. CMS uses a “measure-applicability validation process” to verify whether a physician could have reported on additional measures before determining whether reporting requirements for the bonus have been met. CMS analyzes claims to determine if other measures could have been reported (based on ICD-9 and CPT codes). If CMS finds that 30 or more patients/encounters during the reporting period were eligible for reporting another measure, then the physician practice will not have met the reporting requirements. Financial Incentive Paid to TIN: PQRS tracks compliance with the reporting requirements at the individual provider level (using the NPI number), but the PQRS payment will be made to the Taxpayer Identification Number (TIN) used by the reporting physician. Participating physicians within the same practice (using a common TIN) should expect to receive the physicians’ incentives in a lump sum. Likewise, physicians who see patients on behalf of more than one practice (and, therefore, use more than one TIN when submitting Medicare claims) should expect their PQRS payment to be made to the respective TIN under which the services were reported. For more information about PQRS, the California Medical Association has published a guide that is available online at www.cmanet.org. For official PQRS information, please visit the CMS website at www. cms.gov/pqrs. Two suites, ranging from 1,000 to 1,645 sq. ft., at gross lease cost. Excellent parking. Located next door to Los Gatos Community Hospital. Both units currently available. Call 408/3551519. Medical space available in medical building. Most rooms have water and waste. Reception, exam rooms, office, and lab. X-ray available in building. Billing available. 2,500–4,000 sq. ft. Call Rick at 408/228-0454. First class medical suites available next to Saint Louise Hospital in Gilroy, CA. Sizes available from 1,000 to 2,500+ sq. ft. Time-share also available. Call Betty at 408/848-2525. West Valley Professional Center, 5150 Graves Ave. Suite 2/stand-alone unit. Private office, reception area, exam rooms with sinks. Available 2/1/11. Call owner at 408/867-1815 or 408/2217821. 2395 Montpelier Dr #5, San Jose 95116. Rent $2,000 per month. Lease required. Owner pays triple net and monthly H/O dues. Two doctors set up. Three examination rooms. Approximately 1,100 sq. ft., furnished or unfurnished, adequate parking, walk to Regional Med Ctr. Close to X-Ray and lab. Previous tenant doctor retired. Call Marie at 408/268-2040. Convenient location. One large private office plus one exam room, shared waiting room and front office. Newly built, total 1,280 sq. ft. Available now. Please call 408/438-1593. Spacious, recently remodeled, excellent parking, flexible terms. Call Molly at 831/644-9800. Lease: Approximately 1,900 sq. ft. Free standing building zoned medical. Turn key. Marble entry. Street front. Six treatment rooms. Prestigious physician’s office with balcony. Highway 85 at DeAnza Blvd. Call 408/996-8717. Excellent location. Westgate area. 1,584 sq. ft.
Medical volunteers needed for the Rotacare Free Clinic in downtown San Jose at Washington Elementary School on Wednesday evenings 6-9 pm for adults. School address is 100 Oak St. The clinic is on Edwards between Almaden and First. The neighborhood is residential. Patients are Hispanic, Ethiopian, Asian, and Caucasian. Diabetes, diagnosed and undiagnosed, is often encountered. MDs, RNPs, and PAs are needed. Spanish interpreters always available. Restaurants donate dinner. Can you help…once a month or so? Please contact Roger Lake, MD at: rogerlake@sbcglobal. net or Henry T. Lew, MD at: henrylew9@aol.com. Luxury modern 1,300 sq. ft. turn-key office with minor surgery OR. Prime Good Samaritan/Bascom Avenue at Highway 85 location in multispecialty building. Interior amenities and terms negotiable. Email am.1960@yahoo.com. 1,300 sq. ft. suite in medical office complex, adjacent to, and walking distance from Regional Medical Center of San Jose. Please call 408/568-8323. Established private medical practice in Mountain View has space available for another physician. Expense and space-sharing arrangement negotiable. Call Rashmi at 310/498-8194 for details. exam rooms, two offices, large waiting room and front office, 1,600 sq. ft. Time-share for any days. Rent negotiable. Available now. Please call 650/906-1002. Second story of professional building across from SVMH. Private balcony. Freshly painted and carpeted, ready for occupancy. 1,235 sq. ft. at $1.25/sq. ft. Rent is $1,544/month. Contact Steven Gordon at 831/757-5246. Our occupational medical facilities offer a challenging environment with minimal stress, without weekend, evening, or “on call” coverage. We are currently looking for several knowledgeable and progressive primary care and specialty physicians (orthopedist and physiatrist) interested in joining our team of professionals in providing high quality occupational medical services to Silicon Valley firms and their injured employees. We can provide either an employment relationship including full benefits or an independent contractor relationship. Please contact Rick Flovin, CEO at 408/228-0454 or email riflovin@allianceoccmed.com for additional information. www.Mrosenconsulting.com 831/884-5490 your CV to kaajhealthcare@gmail.com. Part-time chemotherapy certified/infusion nurse for a private practice in Mountain View. Days and hours negotiable. Call 650/274-5175. You Work to Protect Your Patients We Work to Protect You By Marsh As a physician, you probably know better than anyone else how quickly a disability can strike and not only delay your dreams, but also leave you unable to provide for your family. Whether it is a heart attack, stroke, car accident, or fall off a ladder, any of these things can affect your ability to perform your medical specialty. That’s why the Association/Society sponsors a Group Long-Term Disability program underwritten by New York Life Insurance Company, with monthly benefits up to $10,000. You are protected in your medical specialty for the first 10 years of your disability. With this critical protection, you’ll have one less thing to worry about until your return. •	A 10-Year Medical Specialty Definition of Disability defined as the inability to work in your own medical specialty for the first 10 years after the waiting period (a very important distinction vs. many plans with a broad “inability to do ANY job” definition) •	Your monthly benefit payments are not taxable when you don’t take your premium as a tax deduction under current tax law. That’s not necessarily the case for employer-provided plans, where you could lose up to 40% of your benefit to taxation. (Always consult your tax advisor.) •	Group rates are negotiated exclusively for SCCMA/MCMS members. Learn more about this valuable plan today! Call Marsh/Seabury & Smith Insurance Program Management for free information, including features, costs, eligibility, renewability, limitations, and exclusions at 800/842-3761. Underwritten by New York Life Insurance Company, 51 Madison Avenue, New York, NY 10010 Under Group Policy No. G-29322-0 on Policy Form GMRFACE/29322-0. For over 30 years, the Cooperative of American Physicians, Inc. (CAP) has provided California’s finest physicians, like San Francisco facial plastic surgeon Corey Maas, MD, with superior medical professional liability protection through its Mutual Protection Trust (MPT). Physician owned and physician governed, CAP rewards excellence with remarkably low rates on medical professional liability coverage – up to 40 percent less than our competitors. CAP members also enjoy a number of other valuable benefits, including comprehensive risk management programs, best-in-class legal defense, and a 24-hour CAP Cares physician hotline. And MPT is the nation’s only physician-owned medical professional liability provider rated A+ (Superior) by A.M. Best. We invite you to join the more than 11,000 preferred California physicians already enjoying the benefits of CAP membership. NORCAL Mutual is owned and directed by its physicianpolicyholders, therefore we promise to treat your individual needs as our own. You can expect caring and personal service, as you are our first priority. Contact your broker or call 877-453-4486 today. Visit norcalmutual.com/start for a premium estimate.